have heard the cries of boredom from their children at some point during the warm season. Once the excitement of homework-free days wears off, some children slip into lazy mode. They forget about their colossal imaginations and extreme vitality. They may decide that staring at a computer screen is all the emotional or physical exercise they need. If you long to see your child move more than his or her fingers during the summertime, there are several outdoor toys you should invest in. The best way to minimize boredom in children is to encourage movement. An active body is often the springboard to an active mind. While most kids enjoy the basic physical activities such as hide-and-seek, tag or dodge ball, these classics can lose their luster quickly. You can capture your child’s attention for longer periods of time by providing an entire obstacle course of toys. This essentially tricks a child into believing there are endless objects to investigate and explore. One must-have outdoor toy for any family is a climbing set. 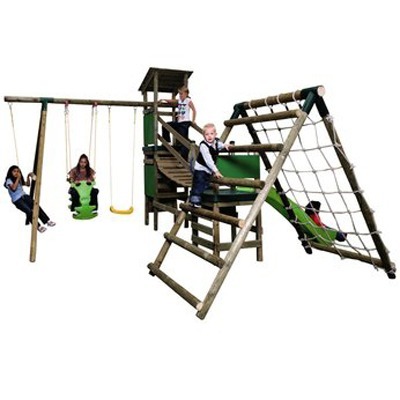 If you cannot afford to build or purchase a full play set, there are small cargo nets and miniature rock walls available at reasonable prices. You can also get children moving by supplying them with items such as nylon sacks for sack racing, child-sized cars powered solely by the feet, or small, inflatable trampolines. Bouncy houses and play tunnels give kids the chance to use their bodies as well. Many kids love to participate in sports. You can use this to your advantage by providing numerous competitive games such as ladder ball, bean bag toss or plastic horseshoes. To amp up the energy level, place a soccer net at each end of your yard, and let kids use different types of balls to score points. Another ideal toy for getting kids moving is a stomp rocket. Children of all ages can stomp on the launch pad and blast the rocket into the air. Children need mental stimulation as much as they need physical exercise. There are numerous outdoor toys that combine fun with learning. One of the best educational outdoor toys is a backyard explorer kit. You can find these kits at any toy store, but you can also make your own. Fill a briefcase with items that encourage exploration. Some essentials include a microscope, a bug catching net, a flashlight, a notepad and pen, a compass, and an album for collecting leaves. Another great outdoor learning toy is an inflatable globe. You have multiple options to choose from, including an animals of the world globe and a labeling globe for teaching the locations of continents, oceans, mountains and notable landmarks. Sizes vary, but a giant globe may spark more interest in the younger generation. You can stick with the geography theme by giving your child an educational play mat as well. These vinyl mats are designed to teach kids a variety of lessons. A good way to foster curiosity in a child is to offer activities that involve hands-on learning. A sand and water activity table provides textures that many kids would find appealing. You can teach your child about science and nature without having to open a single book. Whether you make mud pies or explain water displacement, you can help your child discover the wonders of life while enjoying the great outdoors. Sometimes, a child just needs to be youthful. Childhood speeds by, so take some time to slow things down. Let your little one enjoy the silliness of being young. Supply the kids in your life with bubble machines instead of individual wands, and give them splash balls in place of water guns. Walkie-talkies that alter the voice and remote-controlled vehicles that flip and bounce are much more exciting than the traditional counterparts. If you want to be the party-planning hero in your child’s life, invest in some messy games and toys for the neighborhood kids to enjoy as well. A plastic gun that shoots marshmallows, a face painting set and an aqua sand kit supply just the right amount of gooeyness and messiness to keep little minds entertained. Have the sprinkler ready for the post-chaos cleanup! Regardless of how many fascinating outdoor toys you offer to your children, boredom may make a visit. The key to avoiding days and days of dullness is to provide choices. Divide the toys into categories based on the calendar. Every month, switch to a new set of items, and don’t allow your children to see the upcoming toys until it’s time. If you give your kids variety and provide them with ample opportunities to move, think and laugh, you may never have to listen to the summertime blues again.